While sitting comfortably in the middle of Renault’s three-strong SUV range, writes Iain Robertson, the Kadjar is by far the most in-demand of its models, with almost half-a-million sold, which makes total replacement difficult and careful titivation vital. When Renault introduced us to its all-new SUV around four years ago, it would be fair to say that it hit the road running and delivered in virtually every respect. Of course, as Renault’s version of the well-established Nissan X-Trail, cladding it in a well-proportioned body, with access to the Alliance’s wide engine and transmission choices, it was given a healthy kickstart. In fact, it has done a lot more for Renault than the brand could have hoped for, especially as its Laguna model was not being replaced and the SUV sector was in an upwardly mobile state. Now, well-established and being forced to endure typical mid-term model maladies (a bit like the US Presidential situation…no, not really! ), the time for a number of detail improvements to be made has been reached. They will combine to boost Kadjar sales, when the car goes on sale early in the New Year. 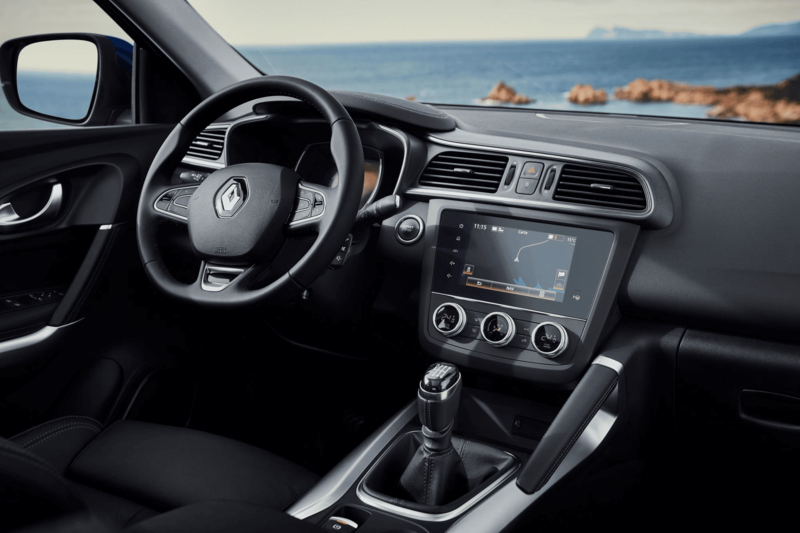 Featuring a stronger visual identity, with a bolder front grille and Renault ‘lozenge’, with a more contemporary interior design, with a reported focus on perceived quality, Renault is entering 2019 with high aspirations for its important midfielder. The car features a long list of standard equipment including a seven-inch infotainment touchscreen, LED daytime running lights, rear parking sensors, automatic lights and wipers, and front fog lights on every model. I was slightly surprised not to see the application of the vertical touch-screen in Kadjar’s centre-stack, as used by the Megane model. However, as it is a singularly hateful device that is fiddly and complex to use, perhaps Renault has thought the better of it, opting for a more logical design instead. The model range is made up of four versions, a reduction from five of the original generation Kadjar. In addition to the now-familiar Play, Iconic and GT Line trims there is a new model, S-Edition. More determinedly style-focused, it sits between Iconic and GT Line and brings features such as more striking interior upholstery (apparently unique to it), as well as redesigned LED headlights, a rear-view camera and a panoramic sunroof, features that are shared with the generously equipped flagship GT Line. Yet, call me ‘spoilt’ but I feel less drawn to the new Kadjar than I was with the first generation. Perhaps it is the recent exposure to Skoda’s ‘simply clever’ elements in its cars that causes such indifference, but the Kadjar, for all of its promise of ‘greater quality’ and ‘enhanced trim detailing’, leaves me cold. While I hope that Renault is not following a similar route to Peugeot-Citroen, in their adulation of all things Germanic, the Kadjar feels significantly out-of-step with the rest of the hugely competitive market. Its engine line-up features the latest TCe 140 and TCe 160 4-cylinder petrol engines that have been developed by the Renault-Nissan Alliance working closely with Daimler (Merc), they meet the highest expectations in both performance and drivability. The companies signed cooperative agreements a couple of years ago and this is the first fruit of the technological arrangement between the brands (not counting Merc’s development of the Nissan pickup truck, to create the X-Class range). The revised Blue dCi diesel engines, in both 115 and 150bhp forms, gain enhanced power, while offering fresh technology to cut exhaust emissions and clean-up their acts. The TCe 140 and dCi 115 power units are available with a choice of a six-speed manual, or a seven-speed automated-manual gearbox (not unlike VW’s DSG system), while the TCe 160 is available with a manual gearbox alone. At a later date, a dCi 150 engine will be available, exclusively in manual gearbox configuration, with a choice of two- or four-wheel drive. While the car’s exterior remains largely unaltered, the wider grille includes chrome inserts and the use of more body-coloured elements to give the car a stronger on-road stance. The more contemporary interior (see comments above) features new controls for the air-con, different air vent surrounds, door handles and a centre console with satin chrome inserts. The switches for the electric windows and mirrors now feature practical backlighting, which is more helpful during night-driving forays. The in-cabin storage is vastly improved, with bigger door pockets, enlarged drinks-holders and an illuminated centre-box/armrest. While I found no issues with the original seats, the comfort levels have been improved, with a redesign to frames and the cushioning. Improvements have been made to connectivity and both driving assistance and dynamic safety electronic packages have been upgraded to the latest levels. Thanks to its association with Nissan, the 4WD transmission on Kadjar benefits from three different operating modes, selected using a thumb-wheel on the centre console. Managed electronically, the system provides improved grip for slippery on-road conditions, with a snow setting that alters the shift characteristics of the auto-box and throttle pedal appropriately. However, the car has a generous ground clearance of 200mm and, with an approach angle of a modest 17-degrees and departure of 25-degrees, it is capable of competent off-road driving, as long as the ground is not too soft, or wet. 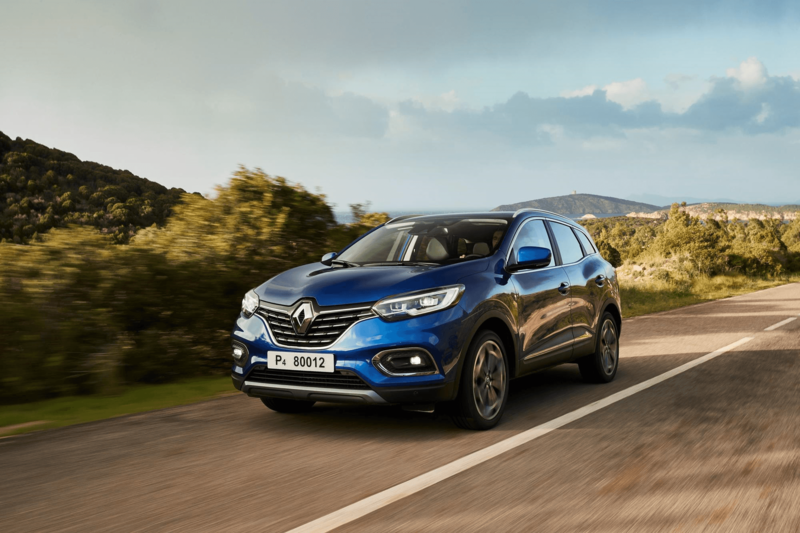 Conclusion: The latest versions of the Kadjar retain the first-class handling and roadholding of the original models in a broadly customer-pleasing package that should continue the good news for Renault. I just wish that the firm’s designers would consider being more Gallic in their approach, as it might pay them dividends.